Spotted by Kotaku reader Chardyll, his t-shirt isn't for Rockstar's Western Red Dead Redemption. Nope! Chardyll complemented the customer in his game shop wearing the shirt. "At first, the height of the counter obstructed the big band logo at the bottom of it, so I complemented him on his Red Dead shirt," Chardyll says. "He then informed me it was for a band called 'Silverstein' and he then showed me the logo." Silverstein is a Canadian post-core band named after Shel Silverstein. The group does not appear to have any connection to Red Dead Redemption. As a group they are not listed on the Red Dead Redemption soundtrack. 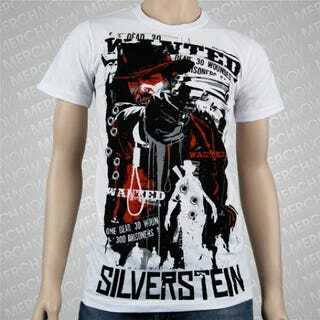 The shirt features Red Dead Redemption protagonist John Marston. Bill Elm and Woody Jackson, who both composed most of the Red Dead Redemption soundtrack, do have a song called "Already Dead". Silverstein also has a song called "Already Dead" from a few years back. Chardyll correctly points out that it sounds nothing like the "Already Dead" in Red Dead Redemption. "The irony in the story? The guy who was buying the game," Chardyll adds, "the one wearing the shirt? He was buying Red Dead Redemption, and didn't realize there was a connection between his shirt and the game."